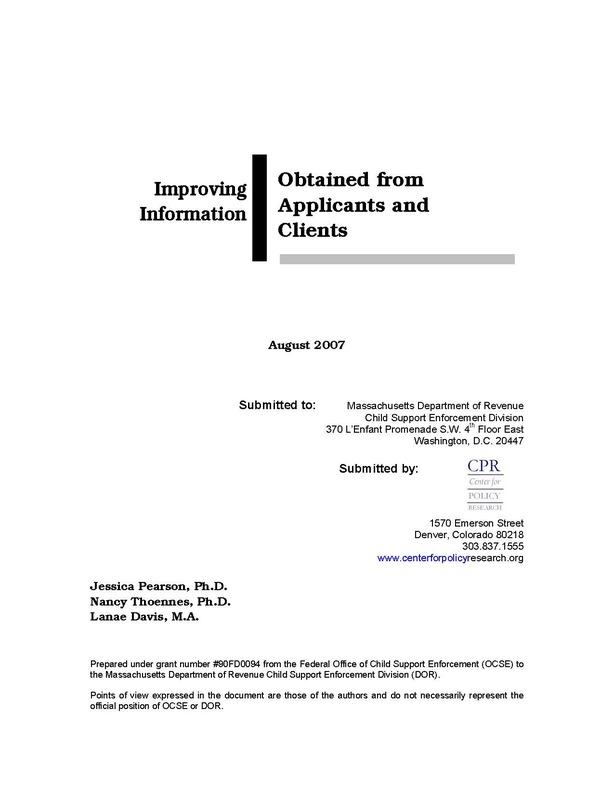 The Child Support Enforcement Division of the Massachusetts Department of Revenue (DOR) collaborated with the Department of Transitional Assistance (DTA) to conduct a project funded by the federal Office of Child Support Enforcement (OCSE) to increase the amount and quality of usable information about noncustodial parents elicited from applicants and recipients of public assistance. Welfare reform laws require recipients of public assistance to cooperate with child support enforcement agencies to identify noncustodial parents so that child support can be ordered. Ordinarily, case managers at the public assistance agency conduct all interviews with custodial parents who apply for benefits or appear for a periodic review of their eligibility for benefits. The information they obtain about noncustodial parents is conveyed electronically to child support workers for case processing. DOR workers visit the DTA office several times a month to answer questions from DTA staff or to lead an orientation session with new applicants about the importance of child support, but do not routinely interview the applicants or recipients about the noncustodial parent. This project tested the effectiveness of having a DOR worker at the DTA agency on a regular basis to explain the child support program to individual applicants and recipients and question them about the noncustodial parent. The project was conducted from June 2005 through June 2006, and involved the following three phases: (1) DOR and DTA workers performing joint interviews with custodial parents about the noncustodial parent; (2) DOR and DTA workers performing separate and sequential interviews with custodial parents about the noncustodial parent; and (3) DOR workers interviewing custodial parents who DTA workers referred because they believed the custodial parent withheld information about the noncustodial parent, provided incomplete or inconsistent information about the noncustodial parent, or because they had child support questions that would be best addressed by a DOR worker. The evaluation involved collecting data on the amount and type of information about noncustodial parents generated in interviews with applicants and recipients using DOR versus DTA personnel during each phase of the project and interview format. Since a key goal of the project was to produce higher rates of child support order establishment and payment, a component of the evaluation was to assess child support outcomes in cases with custodial parents who were exposed to different interview formats and personnel. The evaluation also examined the comparability of information on the noncustodial parent recorded on automated systems maintained by DOR and DTA. In addition to these quantitative assessments, the evaluation included focus groups with workers, exit surveys with clients, and staff questionnaires.